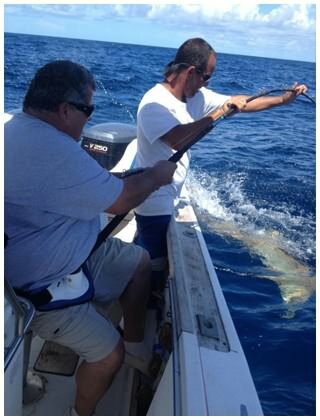 Captain Corey holds the line while a guest angler brings in the Shark! 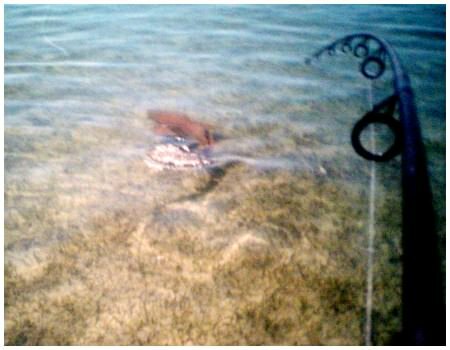 The waters off the shores of Daytona Beach are home to many creatures including big sharks like this nurse shark. Not all sharks species are “Keepers” and some are just too big and dangerous to bring aboard but it’s all about Having Fun, Making Memories and capturing some great photos! For more details, please see our Rates page. Thanks! Just beyond the breakers along the shores of Daytona Beach you’ll find some of the best shark fishing in all of Florida. 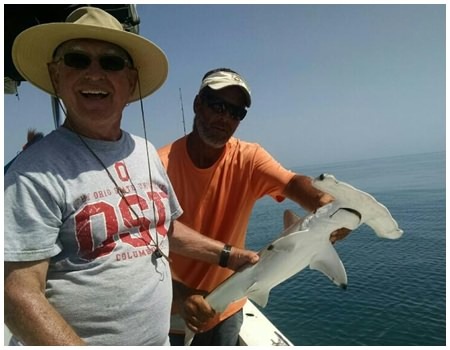 Captain Corey’s “Nearshore” Fishing Charters along the fertile fishing grounds found along the Atlantic Ocean just off the shoreline produce an abundance of sharks for the taking. These include a wide variety of shark species including Bull Sharks, Black Tip Sharks, Lemon Sharks, Bonnet or Shovel Head Sharks and many more species. The sharks we catch on these Nearshore Shark Fishing Trips typically range in size from 3 to 6 feet in length however much bigger sharks are often caught by anglers fishing with Captain Corey. Forget About Shark Week! Shark Fishing is Year Round in Daytona Beach! And remember, there is no long traveling time lost getting to the fishing grounds when you’re shark fishing right offshore beyond the breakers with Captain Corey and On The Hook Charters in Daytona Beach. 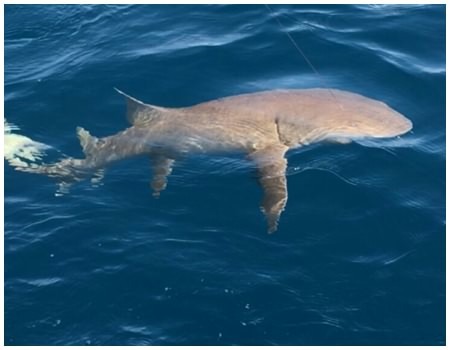 The state of Florida has regulations that determine which of these shark species and which sizes are considered “Catch and Release” and which are “Keepers”. Captain Corey is familiar with all the Florida regulations that determine which species and sizes of sharks you will be allowed to keep and which must be released. 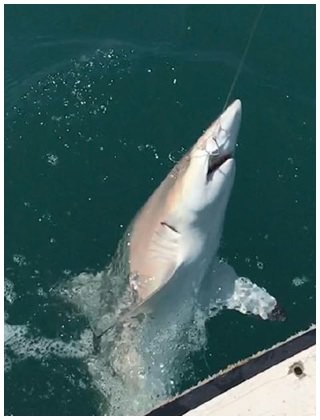 Either way, shark fishing with Captain Corey is an exciting adventure and no one who hooks a fierce fighting shark with Captain Corey will be disappointed. Shark Fishing is great year round in the waters off Daytona Beach. Call Captain Corey for more details and to arrange your next Daytona Beach Shark Fishing Trip! 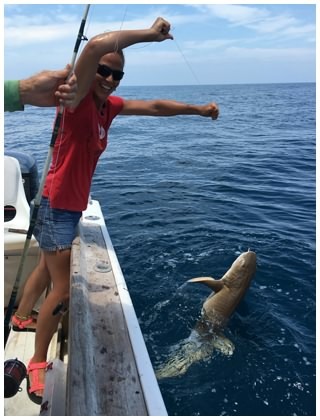 Nothing beats the excitement of a shark on the line! OK, maybe a 1000 pound blue marlin but for that you need an overnight fishing trip to the Gulf Stream. These sharks are caught nearshore, right off the beaches of Daytona Beach and New Smyrna Beach, Florida. 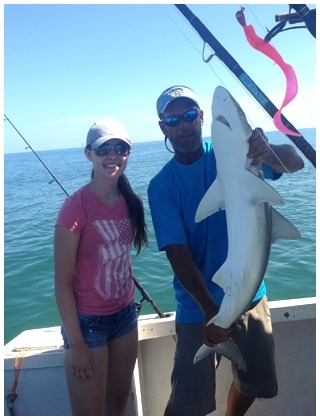 Captain Corey of On the Hook Charters specializes in Shark Fishing Trips! Captain Corey shows off a nice size Atlantic Sharpnose Shark this young lady caught while shark fishing with On The Hook Charters in Daytona Beach, Florida. Rod Bending Action Captain Corey gives a hand while a client reels in an 8 foot Lemon Shark on a nearshore Daytona Beach shark fishing charter. Notice how far the rod is bending as Captain Corey and his client work to bring this big shark in. Pole Bending Action! 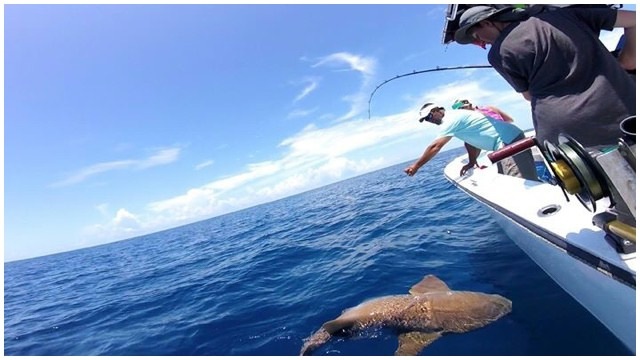 A nice size Nurse Shark on the line with Captain Corey Simmons. Captain Corey specializes in Daytona Beach shark fishing charters. 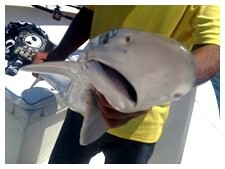 Another shark on the line caught fishing with Captain Corey near Daytona Beach. Bring the whole family for a fishing trip they will be talking about for a very long time! There’s nothing more fun than catching Sharks in Daytona Beach with Captain Corey and First Mate Melissa! This is a Hammerhead Shark!